A proposal to allow council workers to wear Easter Lilies would be an “extremely retrograde step that could only cause division”, a DUP MP has said. Derry City and Strabane District Council are to vote on the proposal next month, after it was agreed at committee level on Tuesday. DUP councillor David Ramsey has warned his party will take legal action if the policy is approved, while his party colleague and MP for East Londonderry Gregory Campbell described the Easter Lily as a symbol associated with “violent Irish republicanism”. Sinn Fein councillor Mickey Cooper said the proposal was “an example of inclusive politics” and had come about after a working group had taken advice from the Equality Commission. 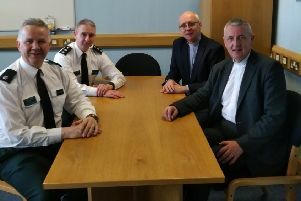 The Equality Commission, however, told the News Letter its guidance to the council was that the Easter Lily falls into a category of “emblems which may have the potential to cause disharmony and, especially, those that have been directly linked to community conflict in Northern Ireland and/or to local politics”. The proposal, which was first put forward by the independent republican councillor Paul Gallagher in 2016 ahead of the 100th anniversary of the 1916 Rising in Dublin, would also allow for poppies to be worn by staff during the week of Remembrance Sunday and Armistice Day. Both Mr Campbell and Mr Ramsey said there was no parallel to be drawn between the poppy and the Easter Lily. Mr Campbell said: “The Equality Commission and other bodies that would adjudicate on impartiality in the workplace have come out and said, down through the years, that there is nothing contentious to do with the poppy. It is not identified with a single section of the community. Mr Campbell suggested the Easter Lily could cause problems for victims of IRA atrocities, such as the Claudy bombing of 1972. “If someone chooses to wear an Easter Lily, that person is clearly identifying themselves with violent Irish republicanism. If anyone who had relatives in Claudy or in any other Provisional IRA atrocity came across or were dealing with a council staff member who was wearing an Easter Lily, they could quite reasonably come to the conclusion that they are dealing with someone who would endorse that activity. DUP councillor David Ramsey suggested his party could make use of a legal mechanism known as a ‘call-in’ to oppose the proposal. A spokesperson for the Equality Commission said: “The Equality Commission gave guidance to the council in 2016 and 2017.